Camp in a bag, setup in less than half the time of any other tent I have seen. 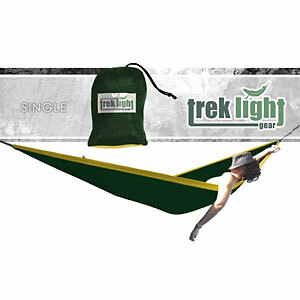 Extraordinary breakthrough in hammock design. There is a learning curve. This is a limited first edition Draumr by Amok. 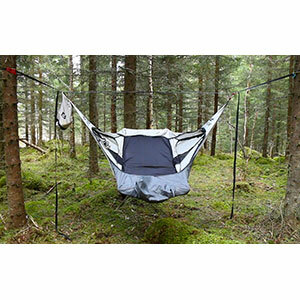 This is a new start up company out of Norway that has come up with a revolution in hammock camping. First shipped end of July 2014. While the overall design is brilliant, there are a few issues that need to be considered before investing in this camp system. Compared to setting up a standard two-person (smallest in my arsenal) with the usual shock corded poles, set up took about a third of the time, and at several points a second person was needed on the standard tent where none was actually needed on the Draumr (it was just too exciting not to check out how it worked). The designers were obviously men whose balance is in the shoulders rather than the hips as it is with women... which means I may need to work on an alternate entry method. Now in my 60s, I had pretty much decided sleeping on the ground was not a preference ... not only do I prefer more padding now days, I also appreciate the head start on standing up that being up off the ground gives you. This shelter system looked to be the perfect lightweight solution. There is also a certain amount of agility that is required to put oneself into the proper placement of buttox to "bag" (not really a bag)...balance and holding onto the ridgeline you sort of lift yourself onto the "bag". 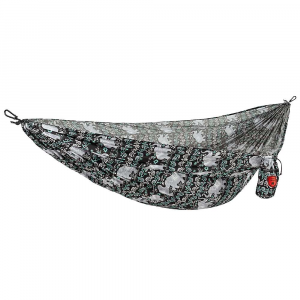 So you fold up the foot, sit above that, then bring your knees to your chin (not even possible with my right bad knee thank you) and bring your feet into the hammock.... this is where there is what I am calling a learning curve. Finding the sweet spot for being able to actually get a knee into this that does not bend very well anymore required more shifting and scooting, eventually I figure I will get this down. The Draumr is rated to hold 260 lbs, and I admit I am 230 currently (really gotta work on this) and I can tell you after a short time I noticed stress on some of the seams. While they seem to be holding, I will be keeping a close eye on the seams that go under me... it was assembled in China. Having read the instructions, and knowing I would need to invest in an inflatable sleeping mat (I have a narrow one that I got in the UK many years ago before they had any with insulation factors, something I thought important with an off the ground setup.) It needs to be noted that if you get the wide pad, you should not get the long, but you can get the long one that is not wide and it will fit far better and not curl around your feet creating less foot room in your shelter. The rocking is very nice, but you can tether the shelter if the slight sway is unwanted. Having ridge lines and tie down lines all being part of their respective parts of the shelter is long overdue as this way you don't end up missing parts and having to improvise. I found I did not have the strength to adjust the lower straps that put the "bag" part of the shelter into a sitting position by raising under the knees, it was not easy to adjust the upper straps for the same position, but with shifting I was able to raise the back/head. There is only room for one person in these, and while it says you can pick trees 10 to 20 feet apart, this is only true with trees of about a 4" diameter trunk. Larger tree trunks cut dramatically into the distance trees can be apart. I will also in future be putting down a tarp floor to leave my shoes on. With all the pros and cons, and any modifications I end up feeling I need to make to make it perfect for my needs, this is by far the most progressive design in lightweight compact shelter since the pup tent. Hi Maureen! Nice first review. I'm a hammock hanger myself. I'm wondering how this works with a tarp for rain protection? 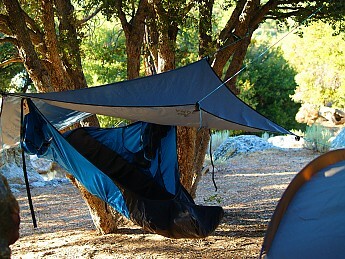 The 90-degree turn of the hammock makes a conventional tarp seem unusable. the tarp has attached lines, the two along the seam are attached to the same trees as the ridgeline, then there are four corners to stake to the ground or tie off to trees.. I liked the more open feel since weather in So CA is seldom extreme. I think a conventional tarp would work if it's ridgeline was high enough above the Draumr... it is just you would feel sideways compared to a standard pup tent, and if the tarp is too short might make it harder to access the Draumr. Hope that answers your question. Thanks for reading, and the vote. So there is a tarp that is specifically made for the unit? I'd love to see any pics you could add to your review. I added pics for you Goose. hey mr King, I do not recall saying lightest solution but if I did a comparison it would not be apples to oranges. 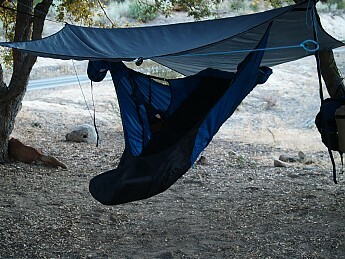 Draumr is an innovation in hammocks, a big Anges does not keep fat old women up off the ground, or allow for the sudden downpour that runs a river through what you thought was a nice dry camp site. You fail to also point out the added weight required for this system is the air mattress/sleep pad you add. So go ahead and shake your head... I am excited that there are innovations in staying off the ground. Ms. Dodge, I watched the video and the sleep system you reviewed showed them adding a ThermaRest NeoAir and a sleeping bag--just like any Skinny/Fat person would add using a normal tent configuration. Might I also suggest picking a better campsite. 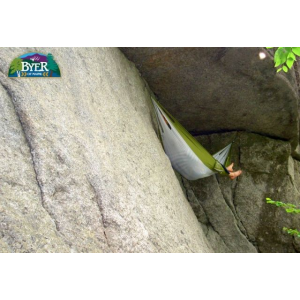 That is one of those things smart backpackers/campers learn so they don't have a river running underneath them. 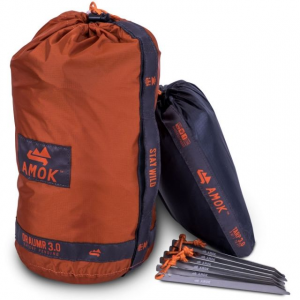 Plus, a good quality tent and an excellent sleeping pad would also guarantee you staying "dry." (since that seems to be one of your major criteria). Glad this heavy, quirky and expensive option suits your needs. @ Maurine--thanks for the pics. @Michael--the difference in sleeping in a hammock is so dramatic that I would sling a hammock in my bedroom if my wife would let me. Admittedly, my hammock set up keeps me out of the ultralight camp (my base weight is 15-17lbs with the hammock, etc), but the comfort of a good night sleep is worth the additional weight. My back is never still and sore when I get out of my hammock. Good review! I am always excited about new innovations in camping gear. And to another point, hammock camping, for most people is dramatically more comfortable. I love my Hennessey set up. It weighs in about the same as my tent but in warm weather, I always go with my hammock unless I am testing something that requires my tent. Nice review, I saw one of these in person at a group hang recently and gotta say I'm impressed with everything but the price and weight. 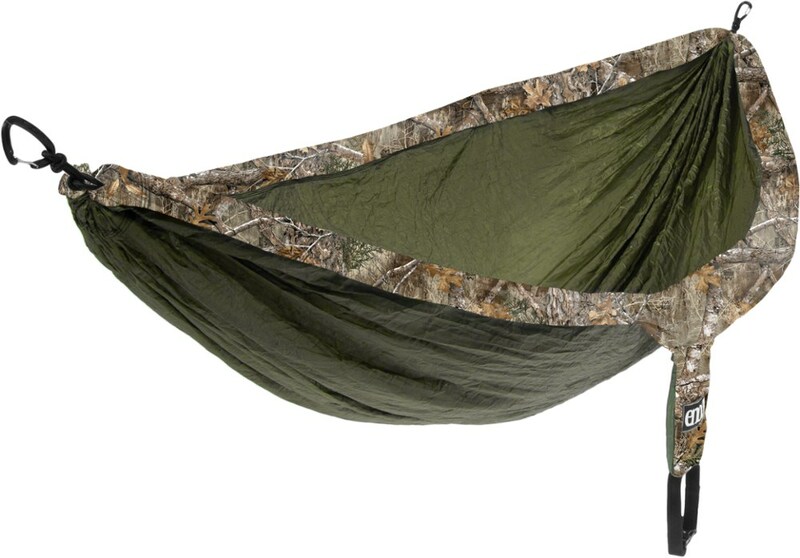 You could by a Wilderness Logics Tadpole tarp (90 @ 11 oz), a Simply Light Streamliner (40 @ 12 oz with suspension), a BIAS Buginator (60 @ 8 oz), a Wilderness Logics Summer Series Quilt Set (280 @ 34 oz for full length UQ & TQ) and you've got shelter and insulation that will take you down to 45* but more like 35* in my experience and I have the 2/3 length UQ and use another brand TQ. So for $470.00 and 4 lbs. you are sleeping warmly. In the month that I've had mine, three times now I've landed on the ground in the middle of the night when rolling on to my left side. Each time the right side buckle would let go! Second time the buckle cut the strap a third of the way through. Third time it cut it bad enough I won't use it. Contacted Amok. New straps on the way. I am starting to question the material the straps are made of. Maybe too smooth for the buckle system. Amok stated they had this happen before, claims it's due to twisting of buckles. How do you prevent twisting when the slightish movement causes it to rock end to end or side to side? Welcome to Trailspace, Irwin. I'm wondering about a 3.5 star rating for a hammock that became unusable after three nights. Can you explain what's good about it? 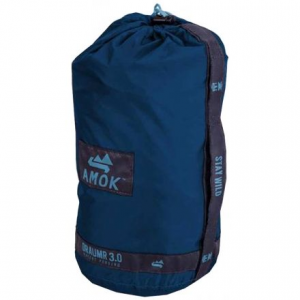 The Amok Draumr is not available from the stores we monitor.